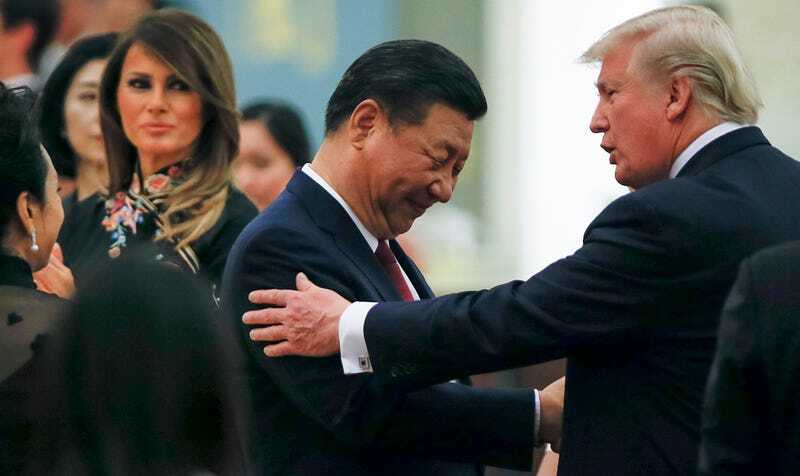 According to the Washington Post’s David Nakamura, Donald Trump asked Chinese president Xi Jinping to look into helping out UCLA freshmen LiAngelo Ball, Cody Riley, and Jalen Hill, who were arrested last week when they were caught shoplifting from high-end luxury stores. The Post reports that Xi promised Trump that he’d look into the shoplifting situation and ensure the Bruins are treated fairly by the Chinese criminal justice system. Chief of Staff John Kelly reportedly has spoken with both the Chinese authorities and the involved families—LaVar Ball played it cool publicly, telling reporters “it ain’t that big of a deal”—while White House press secretary Sarah Huckabee Sanders confirmed to the Post that Trump did indeed chat up Xi about the case. Trump arrived in Beijing as part of a two-day visit on Friday, just a couple days after Ball and his teammates were popped trying to pocket some Louis Vuitton sunglasses. Per ESPN, the Chinese police have video of the Bruins rookies stealing the items, which could result in the trio having to stay in China for an extra week or two. None of the players joined the team for UCLA’s 63-60 season opener win against Georgia Tech.